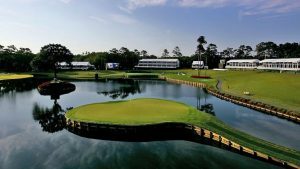 NBC Sports Group’s annual pilgrimage to the Stadium Course at TPC Sawgrass arrived early this year, with The Players Championship shifting from May to March as part of the revamped 2019 PGA Tour golf calendar. The Peacock also had a new partner in covering golf’s unofficial ‘fifth major’ last week, collaborating with new Comcast-owned sibling Sky Sports to offer the most coverage ever from Ponte Vedra Beach, FL. As is par for the course for NBC, the network once again deployed a cavalcade of high-tech production tools to cover the par-3 17th hole’s island green, providing fans with unique perspectives on one of the game’s most iconic holes. The Players’ move to March proved a positive one for NBC Sports’ operations team, slotting The Players right in the middle of its seven-week run of PGA Tour coverage. With Comcast having acquired Sky last year, The Players marked the most extensive production collaboration to date between NBC Sports and Sky Sports. NBC Sports’ week-long coverage includes several collaborations with Sky Sports Golf, which rebranded itself as ‘Sky Sports: The Players’ for the duration of the Championship. Sky Sports Golf aired nearly 25 hours of live simulcast coverage of Golf Central Live From The Players, and the two organisations shared content across their respective digital platforms and social-media handles. NBC deployed eight cameras to cover the par-3 17th, including a microscopic lens embedded in the lip of the tiny bunker fronting the green. A cable-suspended FlyCam system provides unique vantage points by flying over the body of water between the par-5 16th- and 17th-hole greens. A camera crane positioned 150 ft. in the air offered aerial views of Holes 16-18, and another on the island adjacent to the 17th green captures reactions of those playing No. 17. 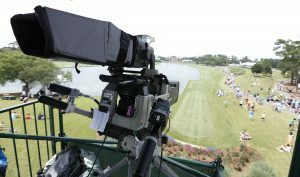 NBC Sports Group rolled out more than 60 cameras to produce more than 150 hours of multiplatform live programming surrounding The Players, including 22 live hours of tournament coverage across Golf Channel and NBC. The camera complement included 27 hard cameras, 14 handhelds, three RAT cameras, six wireless RF systems, three high-speed cameras, seven POVs, and a fixed-wing airplane for aerial shots. In addition, NBC had Toptracer technology capability on all 18 holes, including two RF Toptracer systems that could be used for fairway and second shots as well as on the driving range. Virtual Eye technology, provided by ARL Sports Graphics, also continued to play a big role in the coverage. “We have great partnerships with both Toptracer and ARL,” noted Soucy. “We’re employing a lot more tracing equipment this week as compared to last year.NBC and Golf Channel live tournament coverage is complemented by more than 60 hours of live news, analysis, and features within Golf Central Live From The Players and Morning Drive; nearly 45 hours of PGA Tour Live coverage on NBC Sports Gold; and more than 20 live hours of The Players ‘Launch Pad’ coverage on DirecTV. Inside the compound, NBC deployed its standard golf configuration with NEP’s ND4 (A, B, and C units), and Golf Central Live From The Players sharing ND7 (A, ,B and D units) with DirecTV Launch Pad coverage featuring the 14th hole (airing Thursday-Sunday). BSI served as the network’s RF vendor for the first time at The Players. NBC Sports also utiliised its NEWBERT remote flypack to connect the onsite production at TPC Sawgrass with Golf Channel’s home facility in Orlando. The flypack featured an Evertz SMPTE ST 2110–based IP transmission system, which was first used by NBC at the 2018 Open Championship at Carnoustie. The Switch served as NBC’s fibre vendor for primary transmission and data, providing a 1-Gbps dual redundant circuit. NBC partitioned 310 Mbps for IP video, 14 transmits to Orlando, and eight return paths. 500 Mbps was used for data needs, including FileCatalyst file transfer, corporate internet, and comms. Two ASI circuits were also established for tournament delivery to NBC and Golf Channel. “The additional transmit and receive paths create efficiencies [to allow] Golf Central Live From The Players to be able to keep EVS, ChyronHego, and Vizrt [replay and graphics operators], as well as live tournament social-media graphics [at the Orlando facility],” said Marc Caputo, senior director, remote operations, Golf Channel. FileCatalyst was used for bidirectional file transfer of graphics elements and video clips between Golf Channel in Orlando; the NBC Sports broadcast centre in Stamford, CT; and the NBC Sports TV compound at TPC Sawgrass.